** Out of Stock Until April 2019. The Garlando name comes with the knowledge of over 50 years of game table design and construction. New to the line of Garlando game tables is the collection of table tennis game tables. The Garlando Ping Pong Tables are different from other tennis tables that you may order from the get-go. 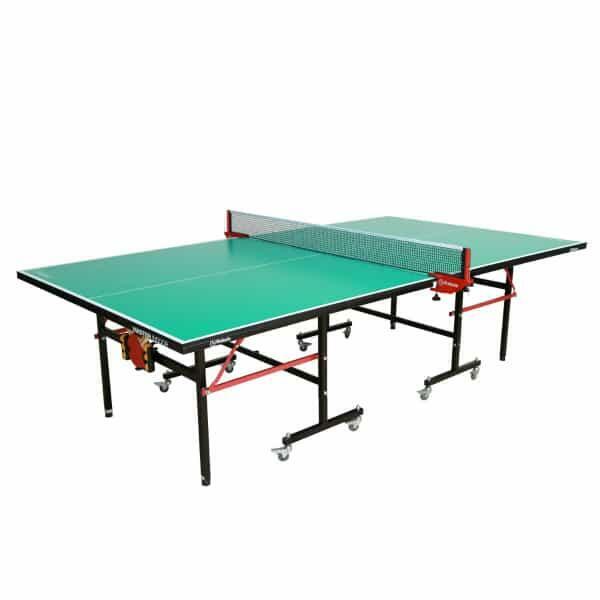 When the table tennis table arrives, it is approximately 90% assembled, carefully done by the manufacturer’s team. The last 10% of the build is done at your home, and should take no more than 30 minutes of efforts. The Garlando Table features a highly functional 16mm high density surface that is coated with an anti-glare finish for quality play. The 8 mobility wheels lock into place for regular play and the table stays steady when the leg levelers are adjusted properly. The table folds in half and wheels unlock for easy movement and storage. Enjoy the ease and flexibility that the Garlando Master Indoor ping pong table provides!